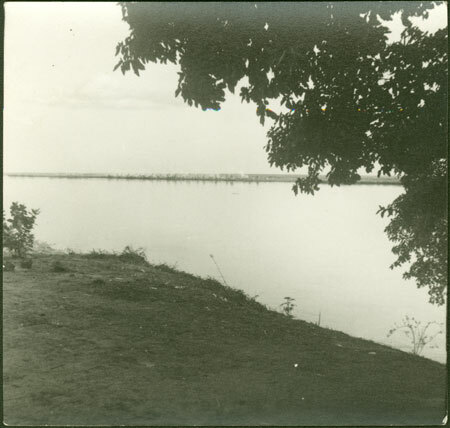 Looking from the bankside of a lagoon in the dry season, with fires and some settlement barely visible on the far bank, probably a dry season camp. This is probably either Lake Moni or nearby, in the area where Buxton carried out four months fieldwork among the Köbora. This group, along with the Tsera, are generally known as riverine Mandari, although they are somewhat distinct from the Western Mandari among whom Buxton mainly worked. Morton, Chris. "Mandari dry season lagoon" Southern Sudan Project (in development). 03 Jan. 2006. Pitt Rivers Museum. <http://southernsudan.prm.ox.ac.uk/details/1998.97.6.2/>.